This walk: 2016-6-23. Norsworthy Bridge, Norsworthy blowing house, mold stone, mortar stone, Leathertor Bridge, Leather Tor, Riddipit Steps, wheel pits, Keaglesborough Mine, Raddick Lane. gate, Crazywell Pool, Devonport Leat, clapper bridge, Cramber Tor, Cramber Pool, Fox Moth caterpillar, Cramber trig pillar, tinners' trial pit, Newleycombe Cross, Crazywell Cross, Roundypark Farm. feather and tares stone. Previous walk in this area: 16th October 2012 and 26th April 2013. Norsworthy Bridge, over the River Meavy. A specimen sessile oak tree. Somewhere I noted another at SX 56720 69770. An aside: Another tinners' mill lies above the right bank 50 yards downstream, and can be found by following a wall which leaves the bank at right-angles. Nearby is a triple mortar stone." Source: George Thurlow (1993 & 2001) Thurlow's Dartmoor Companion, Peninsula Press, page 295. This must be the wheel-pit found at SX 56737 69548 (Norsworthy Mill B). There is also the postulated Riddipit tin mill (blowing house) and the smaller wheel-pit (blowing house?) of Keaglesborough mine to consider, both seen later in this walk. The area is rich in tinning history. It should be borne in mind that tin ore was crushed to a powder in stamping (or "knocking" or "knacking") mills. Knakke is an old Middle English word for "strike" or "crack". The powdered ore was smelted in blowing houses - crushing and smelting did not necessarily occur at the same location. Unless mould stones are found, it is safer to assume that these small houses were stamping mills, as often indicated by the presence of indented mortar stones. A paper by Tom Greaves, entitled Tin smelting in Devon in the 18th and 19th centuries, gives a lot of local detail. Looking for the reputed water wheel axle bearing stone that shows signs of rotational wear (but this stone was "square-cut?). Source: George Thurlow (1993 & 2001), Thurlow's Dartmoor Companion, Peninsula Press, pages 294-295. Zoomed view to Leathertor Farm. Leather Tor Bridge, at SX 56885 69960. Walkhampton Parish Council decided on 20th June 1833 to build a bridge over Riddipit Stream (nowadays, the River Meavy) at this spot (this is the site of the Riddipit Steps stepping stones crossing place). At the next meeting the following month (25th July) it was resolved to accept a tender from George Worth and Wm. Mashford for �26.10s. The seven stepping stones of the old Riddipit Steps (Medieval e.g. 1564, the age of Riddipit Farm) are still to be seen, four in situ (behind the cut ends of the fence railings) and three displaced by floods. Between the the steps and the bridge is the even older ford. Source: Eric Hemery, High Dartmoor, page 126. Apparently, this was the last clapper bridge to be built on Dartmoor (Johnies Meanderings, 20th August 2012). Leather Tor is seen in the distance. Zoomed view to Leather Tor (left, Lether Tor or Lodertorre, SX 563 700, elevation 380 metres/1246 feet). Wheel-pit (filled-in), at SX 57286 70091, looking down the slope, below the main wheel-pit of Keaglesborough Mine (next photograph). Hemery (p.128) discusses the whereabouts of a blowing house in this area "This enclosure, overplanted and above the head of Riddipit Gert, is north of the Raddick-Norsworthy Lanes junction; the relics it contains confirm the documentary evidence that Keaglesborough blowing house was situated here rather than at the riverside". Somewhere around SX 57365 70073? Could it be the photograph above, it is in the same area? It can also use the tail race water from the main water wheel that probably drove the stamps to crush the ore? Keaglesborough Mine main wheel-pit, looking up the slope, at SX 57375 70116 ..... the only known date for the mine is it's closure in 1810 (Hemery, p.128). As previous photograph, looking down the slope ..... showing the tail race running towards the smaller wheel-pit. Fox Moth caterpillar (July-October), about 8 cm / 3 inches in length. Heather, bramble, and bilberry are among its food plants. It will be fully grown by the autumn. It will then hibernate, to emerge next spring without feeding, pupate in March/April and be on the wing in May. Click here for a photo of an adult. Looking across the pool and down the tinners' gert. Clapper bridge over Devonport Leat, at SX 58357 70563. Leather Tor (left, Lether Tor or Lodertorre, SX 563 700, elevation 380 metres/1246 feet), right of centre, Pekk Hill and Sharpitor (right, SX 560 703, elevation 410 metres/1345 feet). Cramber Tor, from the north-east. Common cotton grass, Eriophorum angustifolium with three flowers/seed heads here. The alternative is Hare's-tail Cotton-grass (Eriophorum vaginatum) with a single seed head. These four heifers were very territorial! Large tinners' trial pit? There were several in a row in this area. Devonport Leat, near Older Bridge. Clapper bridge, at SX 59610 70563. The cross is on the skyline, left of centre. Overview of Roundypark Farm, SX 5780 7012 ..... the farm is recorded from 1783 and the roof was caved-in by 1894. Source: Paul Rendell (2007), Exploring around Burrator: a Dartmoor Reservoir; The Dartmoor Company, Okehampton. A double "box", cupboard, cooler feature near a gatepost? Broken double mortar stone alongside the track to Crazy Well Pool, at SX 57512 70034 . Close up of an old feathers and tare, used for splitting the stone. Use of this data is subject to terms and conditions. Also, Copyright © 2005, Memory-Map Europe, with permission. 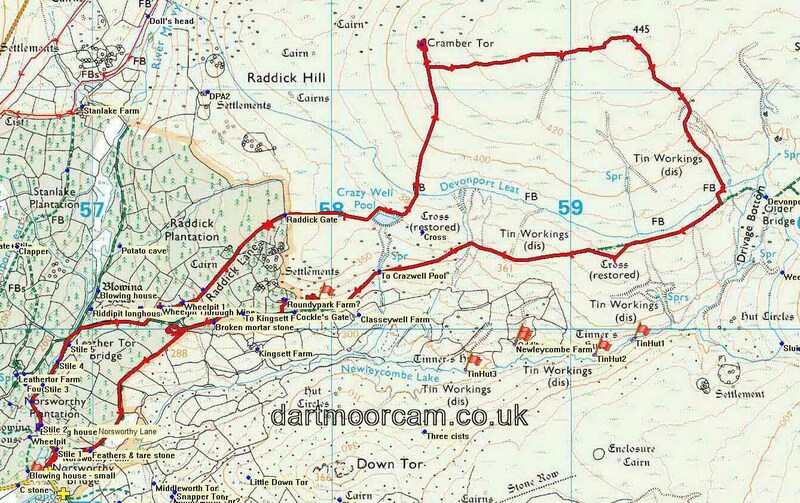 This walk was reached by driving from Dousland (Yelverton) towards Meavy and turning left to Burrator Reservoir. The car park is marked by the yellow cross symbol at Norsworthy Bridge at the north end of the reservoir. Distance - 9.38 km / 5.83 miles.